We are pleased to report that a new defibrillator has now been installed outside of The Willow Centre for community use. One will also be installed at the Pavilion (recreation ground) within a few days. 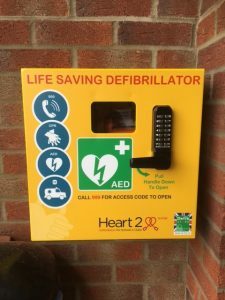 The defibrillators were supplied by Heart 2 Heart Norfolk. The Parish Council is grateful for a generous donation from South Norfolk District Councillor David Bills towards the cost. Could you help your communtiy with grant applications? Cringleford Parish Council is hoping to carry out a number of large projects over the next year and is looking for a resident or group of residents who might have some time to volunteer to work alongside us for a while to chase leads with various charities / businesses and complete grant applications.